If you have a Kroger nearby, you should definitely check your weekly ad to see if they are offering the Mega Deal savings this week. They have selected items marked down to $3, $2.50, $2 and $1.50. Buy ten of these participating items in any combination and you'll automatically receive $5 off your order or 50 cents off per item. I got all of this for $9.25! 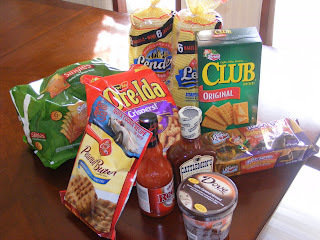 By using coupons which Kroger will double up to 50 cents, I was able to get the cookie mix and hot sauce for FREE. The ice cream cost me 50 cents and the barbeque sauce was a quarter. Special thanks to Marcy for the heads up on some of the online coupons!